A place where we drink , eat and chill with families and friends . The Library is the place that comes to my mind in first . They Library is a nice wind-down venues with live band performaces , game nights , talent competition and more . 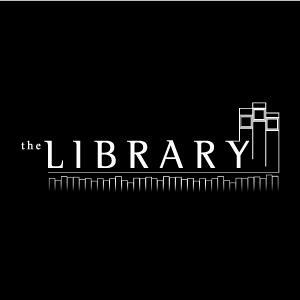 A winning combination of quality food , drinks , music and friends , The Library concept has grown rapidly in popularity . The Library is always one step ahead . Always innovating , always fresh and most importantly , always relevant . Which now brings us to the latest The e-Library in town ! I went to The e-Library at SSTwo Mall last Thursday with other bloggers . This is the first e-library that is set up to explode the new chilling scene and experience in Petaling Jaya and it is also the 10th Library which is opened in just three years ! But , does anyone know what is an e-Library though ? E is for Electronic , Entertainment and Excitement ! This new library at SSTwo Mall sees an evolution of the brand and carries an electronic theme - the first of its kind among all The Libraries . It has an entertainment zone decked out with a gaming area that equipped with cool Xbox Kinect , Daytona and touch screen games , a pool table as well as a e-darts section . For you guys , the songbirds , there are also karaoke rooms where you can sing ! Something new and all in one at The e-Library SSTwo Mall ! I was there last week for the Bloggerton Event ! Cool enough , for us bloggers to gather together and compete amongst each other in teams to try out the most entertaining games at the outlet . 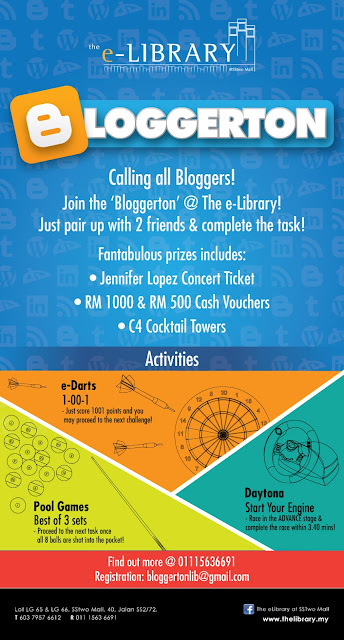 The exciting games includes Pool Games , e-darts & Daytona ! Free flow beer was provided and with the attractive PRIZES to be won ! Briefing the games to the teams. Amanda take the darts challenge ! and me the noob , took the pool games ! dear christine is our Daytone racer ! But Congratulation to our great winners on that night ! The 3 fastest teams that finish the 3 games were given cash vouchers , C4 Tower ( the special tower made only available at The e-Library SSTwo Mall ) and the best of all is the JLO Concert Tickets ! Like here before THURSDAY yah dear friends ^^ ! Do not miss out the Grand Launch on 20 NOV 2012 ! Like their facebook page now !